It’s been an embarrassing month for a team that has as much talent as the Cleveland Cavaliers. Tired legs (excuse), rough schedule (excuse) and the ever-changing availability of what guys are able to play on any given night (also excuse) all have combined to make for an ugly stretch of basketball for the defending champions. Every team plays 82 games. At some point or another during the season, every team has to go through a ridiculous schedule. It just so happens that the Cavs ran into it near the end of the season, which didn’t help matters. Every team goes through injuries at some point or another. It’s true the Cavs have suffered from the injury bug more than most teams this season, but ask any head coach or general manager if they think they’d be able to get by with Kyrie Irving and LeBron James healthy for a full regular season. Not to mention, all that depth and brilliant maneuvering done by David Griffin is now being cited as a problem. The guys aren’t fitting in. As if that completely blindsided everyone who was elated when the moves were made in February. 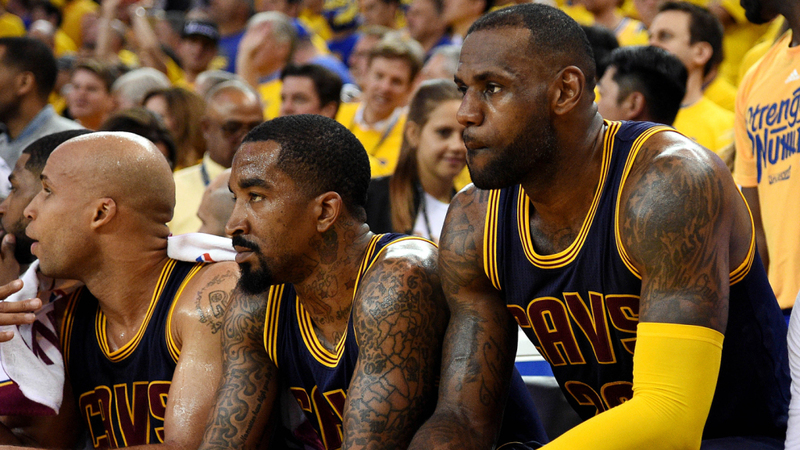 When it comes to the Cavs, the problem first and foremost starts with effort and urgency. Think about it. It took firing their head coach mid-season to wake everyone up last year. It took being down 3-1 in the Finals for the Cavs to play basketball at the maximum level we all envisioned they were capable of doing. It took an ugly January for LeBron to go back to playing MVP-caliber basketball (on both ends) in February to silence the critics. They fell into the trap of taking the regular season for granted and at this point, the team may have to choose between resting stars or pursuing the one-seed in the final couple weeks of the season. Here are my suggestions: first for the Cavs, second for the fans. 1. Shut LeBron down for the rest of the regular season. Rest Kyrie and Love at least four of eight games. Remember when LeBron took that hiatus to Miami in late-December early January of 2014-15? He came back as fresh as he’s ever looked in his latest three-year stint in Cleveland. He’s a different player in the postseason altogether, but imagine having him with nearly three weeks to let his body get back to close to 100 percent. Everyone’s banged up at this time of the year. Almost everyone the Cavs face in the playoffs will have played 75-82 games with no break before the playoffs. As for Irving and Love, there are different reasons to rest both. Irving has averaged 35 minutes per game this season – a number that went down (slightly) after the signing of Deron Williams. In 2015-16, Irving missed the first two months of action, and although the Cavs felt his absence, it may have actually helped in a way to have him with more energy left in the tank come June. Aside from 2014-15 and 2015-16, Irving never appeared in the postseason. If he continues to play 30-35 minutes per night, the rest of the regular season (35-40 in playoffs), he will surpass his career-high for the most total minutes played in a season, including playoffs. Do we really want to run the risk of having a burned out Irving in the Finals? The team relies on him too much to take that chance. Meanwhile, Love’s return has left much to be desired – especially on defense. When it comes to getting back in rhythm, these games are important for Love to get playing time and get back in a groove. However, with three more back-to-back sets (including tonight), he’s already going to get games off anyway. When the playoff seeding is all locked up, there’s a good chance none of the starters will play in the regular season finale (except they’ll throw Tristan Thompson out there for 30 seconds to keep his game-streak going). If the Cavs aren’t going to treat these games like they matter, they might as well not play the stars. It’s a waste of everyone’s time and energy. Which leads me to the next suggestion: for the fans. If the Cavs don’t want to treat these games meaningfully, why should you take your hard-earned paycheck to witness a product that has been dirt cheap as of late? Save your money for the playoffs, when everyone decides to show up. You’ll have a better chance of getting your money’s worth. Even if the Cavs don’t decide to shut LeBron down, there will likely be at least three more opportunities where the King will sit in his throne on the bench. Although I sympathize for fans who pay to see him, at this point of the season, you really can’t be surprised if it happens. And at this point of the season, you have no one to blame but yourself for not expecting it to be a possibility. Bottom line: Get invested in this team when its own players do.